In their quest to market everything under the sun, NECA has acquired the license to a classic videogame property, Castlevania. Since they were debuting the prototypes at SDCC 07, they decided to release a little promotional item as, well. 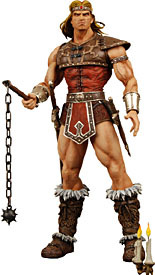 Some companies would create a retro paint job - NECA went with the oldest of the old-school variations: Pixel Simon Belmont. Step into the shadows of the deadliest dwelling on earth. 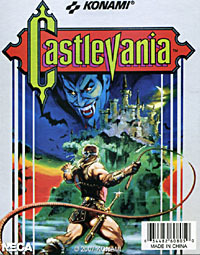 You've arrived at Castlevania, and you're here on business: to destroy forever the Curse of the Evil Count. Unfortunately, everybody's home this evening. Bats, ghosts, every kind of creature you can imagine. You'll find 'em all over the place, if they don't find you first. Because you've got to get through six monstrous floors before you even meet up with the Master of the House. Your Magic Whip will help, and you'll probably find a weapons or two along the way. But once you make it to the tower, you can count on a Duel to the Death. The Count has waited 100 years for a rematch. He's ready. Are you? The hero of the original Castelvania, Simon Belmont is the descendant of a long line of vampire-slaying heroes. He defeated Dracula in 1691 (and again in 1698), using a combination of wits, luck, and his magical whip, Vampire Killer. He's had a lot of varied looks over the years, but NECA went back to the earliest 8-bit incarnation with this little oddity. "Pixel Simon" started life as a joke that one of the main sculptors did, but everyone soon recognized what a cool little marketing tool it would make. Definitely original, that's for sure. Apparently there was some debate about the best way to sculpt and paint the little oddball, but it seems NECA found the way to do it. To begin with, no, this is not an action figure. 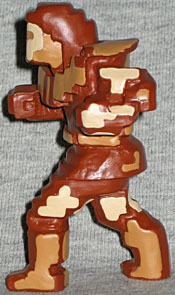 It's an unarticulated figurine. One solid lump of plastic. Or resin, to be more specific. Whatever he's made of, Simon stands just over 2½" tall, has no joints and no accessories. What you see is exactly what you get - not that that's necessarily a bad thing. For a character that was originally just dots on a screen, Simon is pretty dynamic. He's striding forward purposefully, on the march against evil. His sculpt is very blocky, as you might expect, but not quite as perfectly square as it might be. Is that an effort to make the figurine look more organic, or just the result of not being able to get perfectly crisp edges out of the mold? You'll have to decide for yourself. Honestly, it could be either. Heck, maybe both. Pixel Simon only has three colors, and they're all shades of brown. 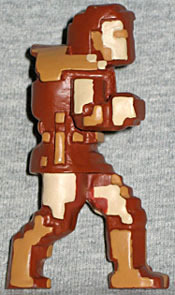 The bulk of his body is the darkest color, with an orangey-tan for his leather boots, belt, bracers and backpack, and a pale tan for his skin. The colors come straight from the classic game, just like the pose. The center of balance isn't quite right, so he won't stand on his own, but you can fix that with some Blu Tack or some whittling. Yes, the pose is based directly on one of the sprites in the game. Well, two of the sprites, honestly - both left and right sides of the figurine were taken from the character maps. In case you want to look at the figurine from directly in front or behind, NECA threw a few paint apps on those surfaces, as well. Since this is one exclusive that you can fully enjoy MOC, the packaging had to be good, and NECA delivered. 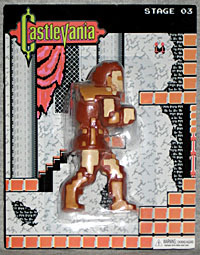 Pixel Simon is sold on a 3½" by 4½" blister card, which resembles the backgrounds of Castlevania. It's credited in the corner as Stage 03 - which would be the Castle Ruins - but the gray and orange more properly identifies it as Stage 01: Main Hall. Either way, it isn't taken directly from anywhere on the real map, so that doesn't matter. The classic Castlevania logo is in the upper left corner, and a choking warning is in the lower right. The rear of the card, seen way up at the top of this review, looks like the original box art. Very nice work for such a minor item. Some fans may not like the idea of paying $10 for a figurine like this, and you can't really blame them - that does seem slightly high. However, a lot of work went into both the figurine and the packaging, and it's retro flavor is great fun. If your idea of an "old" game system is the original Playstation, then this probably isn't for you. For those of us who remember blowing into our Nintendo cartridges to make them work, though, Pixel Simon Belmont is a great exclusive.